What does it mean to feel incomplete? In the search for identity, cultural or otherwise, do we look forward or back? The Tautai of Digital Winds provides a unique blend of Polynesian mythology and storytelling, contemporary experiences, art, dance and music to weave a vibrant production that spans generations and cultures. The cast of new and seasoned actors breathe life into characters attempting to navigate their way through an increasingly digital world. The production hinges on two main narratives that bleed into each other. 16 year old Maui Inati, a kinetic (because he’s always on the move), free-spirited but troubled boy played with the perfect amount of teenaged arrogance by Aisea Latu and the story of Celeste, quiet, poetic whose diary entries detail a story of teenaged angst and heartbreak that ends rather surprisingly- intensely portrayed by Jennifer Perez. The live band is great, stand-out scene: when Celeste is having an intense journaling session dripping with teenaged angst as the band plays an emotional track while interpretive dancers use movements to depict Celeste’s turmoil. The play ends on a rather ambiguous note, taking us back to the initial monologue right after Celeste’s scene that somewhat mirrors Tavita’s (Maui’s brother) except the scene ends before we can find out if Celeste does what Tavita did. The fragmented way in which the story is told allows the show to mess around with time and take us anywhere, a bit like a TV show. The use of video from the Bollywood fantasy- real talk I had a math teacher just like Mr Sadhavas- to Isumus (lol y’all know isumu means mouse in Samoan, right? RIGHT? More on this Jklol Thoughts below) the hacker’s vlog- was on point. There’s an abundant referencing and use of technology, digital winds indeed. Ultimately I did feel the play was a tad long, with a few somewhat dragged out scenes, at over two hours and no intermission it could seem a bit much. However the play hits all the emotional notes with the right amount of humour. The poignancy is not undercut, however, just alleviated. There’s a chance for it to become a little preachy, running the risk of coming off as an after-school-special but there’s a enough gritty realism to stop this thought short. 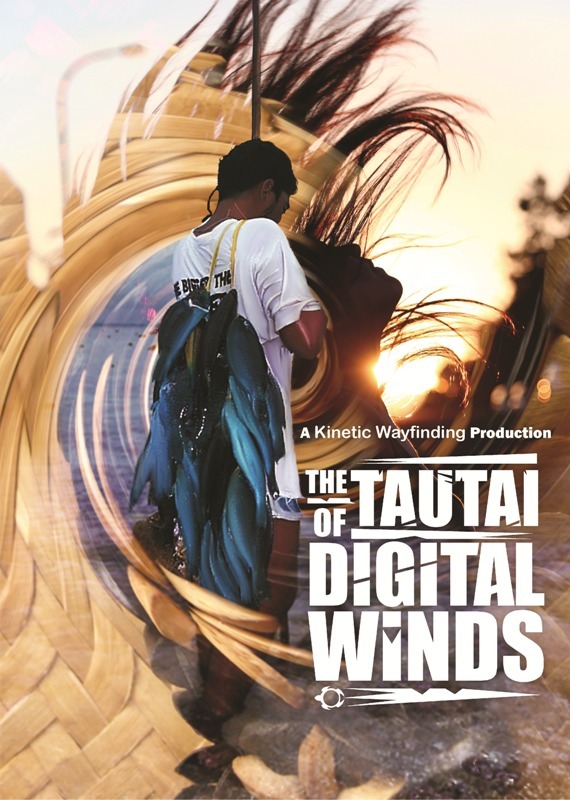 The Tautai of Digital Winds takes the audience on a journey through cultural disconnection and offers contemporary views on the navigation toward identity while giving a hat-tip to traditional mythology. Written and Directed by Iaheto Ah Hi and co-directed by Leilani Clarke. – Tokelauan and Samoan are really, really, similar. I mean I thought so before but I pretty much understood what they were saying in Toke. ALSO yo that feke (octopus) story whose story is it? Because there’s a Samoan myth that’s basically identical, we even have a song! Which I kept singing in my head. Poor Octopus, touch your head. – Where can I get me one of those vests? – I’m pretty sure that’s a funeral song. IT IS! Manaia manaia le lagiiii- don’t sing along to the funeral song you vale. But why’d the kids sing a funeral song for White Sunday-OH. Interesting. This play is in support of suicide prevention and support. There’s a disconnect between the song and White Sunday, while disconcerting, serves to make you stop and think- wait that’s not right… or am I reading too much into this? – The lady behind me keeps talking, lol should I find her a mic? – I can dance like that…no you can’t- okay I can’t. – Jess should have come, that bollywood fantasy would have been right up her alley. Lol is that the Mangere Bridge? – It was a good thing Luisa came so I can bombard her with questions about organisations mentioned. – Straight up, what kind of gang leader nickname is Petalz. Also I would so watch a TV show about their gang. Can we get that funded because I need more of Blinky. BLINKY’S MY FAVOURITE CHARACTER. – Are you loyal, tho’?